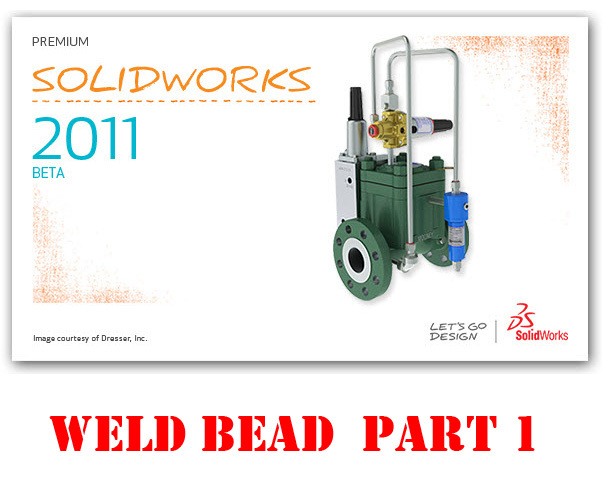 Weld Bead is a “lightweight” feature that is primarily shown in the modeling environment. No Solid Bodies are created as part of the Weld Bead feature. Weld Annotation automatically generated and are modifiable. The strategy in which SolidWorks has gone about in developing this feature is somewhat different than other CAD Vendors. The Weld Bead command is a lightweight feature that does not create an actual solid body in the Part or Assembly files. Here’s a screenshot of what the feature interface looks like. What you see is a graphical representation only. In addition to that, the graphical representation which is the bead, is NOT trimmed to fit the surfaces around the selection area. This is the big performance saver. 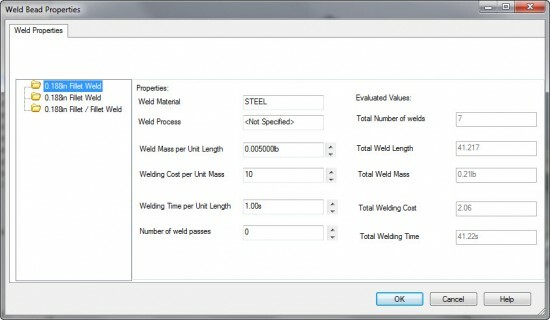 On large weldments where you want to show all of your beads, it can take quite some time for the software to run calculations on all the weld beads. 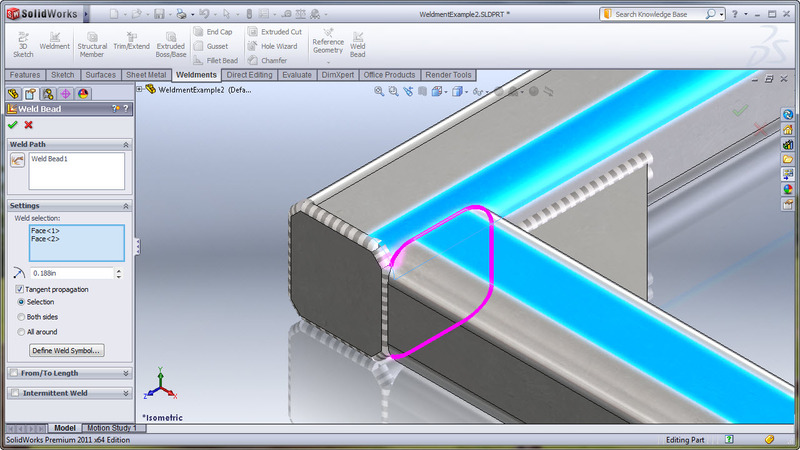 Another advantage of the Weld Bead is that since it is not trimming surfaces, the bead can be applied to a much larger range of face selection combinations. 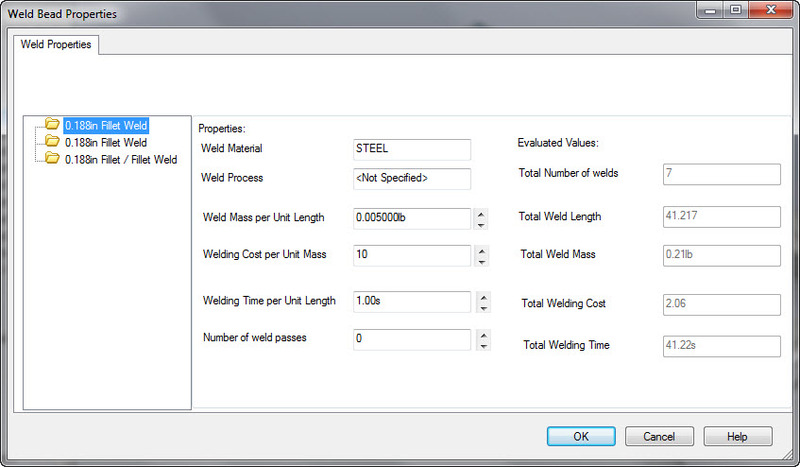 You also have a useful but slightly simplistic way of calculating the mass, cost, & number of passes through the use of the Weld Bead Properties dialog box, which is shown below. Here’s an example of a finished part with all weld annotated with the Weld Bead command. Overall, I like the direction that SolidWorks has gone with this tool. 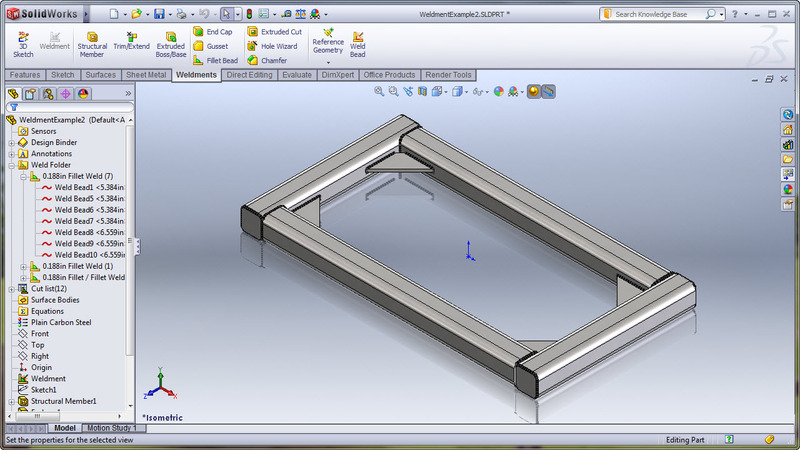 SolidWorks has a reputation in industry for handling Large Assemblies very well, and this feature’s design approach fits right along with that. With that said, I would like to see some things added to it in the next release. We’ll cover more of that in Part 2 of the review. Because of bandwidth issues, I will no longer be hosting videos on my site like I have done in the past. Videos will be offered in two ways. You can view videos via my YouTube Channel, or I will make the MP4 file available for view or download at archive.org I realize that some of you are probably behind a corporate firewall and can’t see YouTube, so that is why I’m providing the download via archive.org. Below is the embedded YouTube link. (The video can be viewed in HD.) Right below that you’ll find the link to view or download the file. Please let me know if you have any issues seeing the video or downloading it from archive.org as this is the first time I have used this service. Hi Ricky, long time since I posted here. Thanks for the weldment intro. The appearance in the model is pretty ‘rough’ in some cases. I think because of the way it has been done the weight would only ever be approximate. It strikes me that it may not be so good for analysis purposes either. It does seem quite quick though. thanks a lot. it’s great that you show new functionalities with videos. very useful. When I first saw this blog I thought Ricky Jordan’s readers should read this! http://hubpages.com/hub/rent-a-laptop-rentals . Renting a laptop makes no sense at all! The cost for renting a laptop for even a couple of weeks is going to set you back as much as just buying it! Yes, I agree that it might be a challenge to include the lightweight beads in the overall mass & CG information, but nonetheless, it would be an excellent enhancement. The quickness of it is probably the thing I am impressed with the most. I would expect the appearance to get a little better in future releases, but can recognize that part of the performance advantage is the software not having to trim the display surfaces to the geometry around the weld areas. @Ricky As always, top-notch article! I didn’t even know where to start with this topic. I would expect the appearance to get a little better in future releases. Great post! I have read all the articles, nice share..
Hi, Ricky. I am always looking for new innovative tinkerings for my husband. He does the welding and the mechanics and I enjoy your site very much. I like to watch the videos you post and when he gets home from work, I start up a conversation about this or that and he is bemused that I can keep up with him! Thanks for the information, I love reading your page. Getting to learn solidworks these days. Your blog helps a lot. The videos are awesome. Whoa, thank you for posting about it. topic appears interesting. Will make a note of the web site and pop back again. Appears like an awesome resource. Best wishes. Thanks for the weldment intro. it’s great that you show new functionalities with videos. I really enjoy your blog. Great instructional video… nicely done! Amazing post: I can’t believe the detail that is involved! Great posting with a nice presentation ,,nice videos here. Hi rick, can you explain to me why I can’t make a bigger fillet size on those two feature? and also did not work on smaller fillet size.